Learning how to get rid of fruit flies on your own is an easy task that anyone can do. You don't need to call an expensive exterminator or use harsh chemicals and sprays, just a few simple household supplies and preventative steps will ensure these pesky flies are eliminated from your home. Then, once the infestation is under control you can go back to enjoying fresh fruit alone, without swarming fruit flies invading your healthy snack. As the summer months approach, fruit flies seem to appear out of nowhere. While they typically are not a problem in the winter, the warm summer heat combined with an abundance of fresh fruits make your kitchen the perfect place for fruit flies to thrive. Fruit flies really don't pose any health or safety issues, they're just really annoying. Plus they reproduce at an extremely fast rate, going from an egg to adulthood in around 8-10 days meaning a few flies can quickly turn into a big problem. 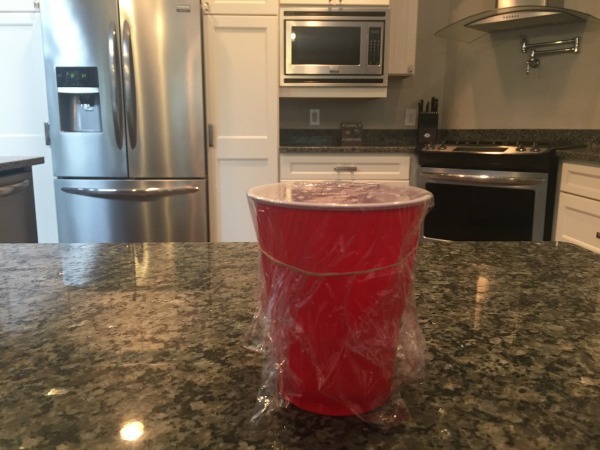 So, if you begin to see these tiny insects buzzing around your kitchen you'll want to do two things to fix the problem......first, remove any open food sources, then make a homemade fruit fly trap to catch the unwanted flies. 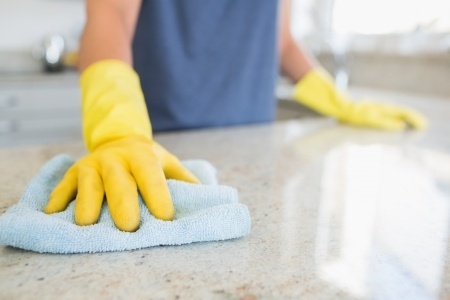 In order to successfully get rid of fruit flies you'll need to remove any uncovered bananas, strawberries or other fruits and vegetables you might have sitting out on your kitchen countertops. As these fruits and vegetables start to get old and decompose, they create the perfect food source for the flies to feast on. The easiest way is to simply put the fruits and vegetables inside the refridgerator, but if you don't have the space in your refridgerator and you want to keep the food out on the countertop for people to snack on, make sure it's in a sealed container. Kitchen sink drains and garbage disposals are two other popular places where fruit flies live and lay eggs. To kill the eggs, pour a small amount of bleach down the drain or a few cups of boiling water. This will kill the eggs and prevent the infestation from getting worse. Also, don't forget about any trashcans that contain old food. Take out the trash on a regular basis to prevent fruit flies from feeding on and reproducing inside the garbage. Once you have all fruits and vegetables stored away and the drains, garbage containers and disposal cleaned, it's time to trap the fruit flies inside the home. Since you've removed all available food from inside your home, the fruit flies will be very attracted to the homemade fruit fly trap. Making your own homemade fruit fly trap is easy. 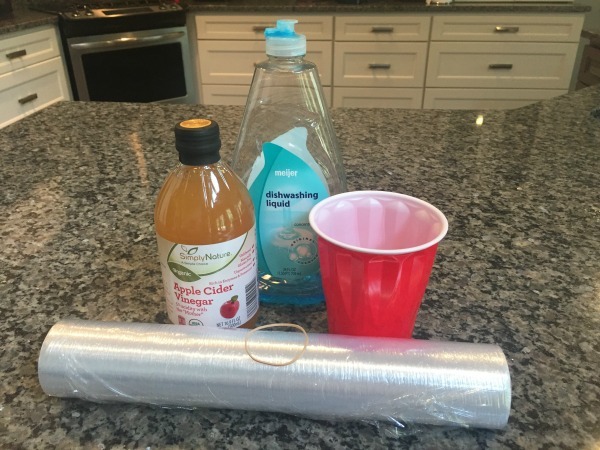 For the supplies you will need some apple cider vinegar, a plastic cup or small disposable container, liquid dish soap, plastic wrap and a rubber band. 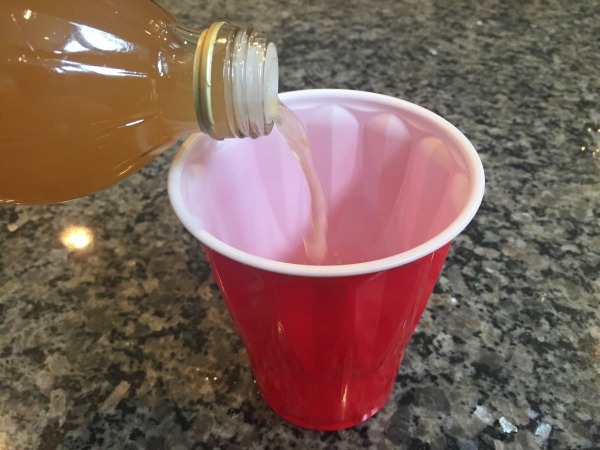 To begin, take the plastic cup and pour approximately two inches of apple cider vinegar into the cup. 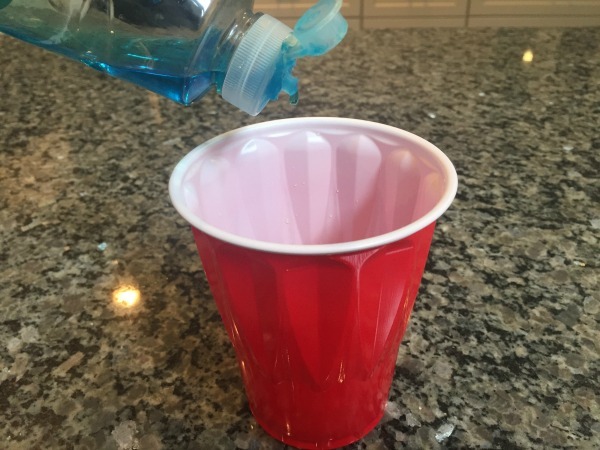 Add a couple of drops of liquid dish soap to the apple cider vinegar inside the cup. The dish soap changes the surface tension, preventing them from being able to fly away. Next, take plastic wrap and stretch it over the top of the cup. 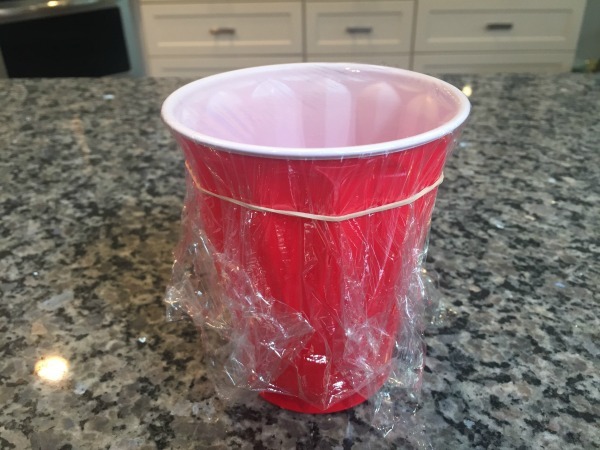 I like to use a rubber band to hold the plastic wrap over the top of the cup, or you can use tape. Once the plastic wrap is in place, use a tooth pick to poke several holes into the top of the plastic wrap. By making the holes about the size of the toothpick, it allows enough room for the fruit flies to enter the trap and it prevents them from being able to crawl back out. There are many variations of the trap that do not use the plastic wrap and you simply keep the top of the cup open, but I've found using the plastic wrap seems to increase the catch rate. Once you have the holes finished your trap is done! 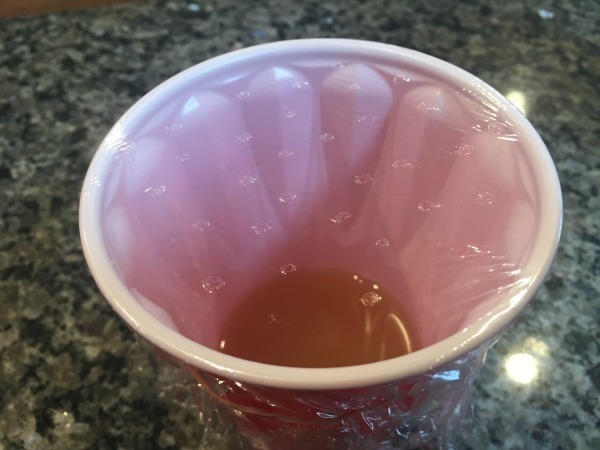 Simply place the trap on your kitchen countertop or anywhere you've noticed fruit flies and the flies will be attracted to the vinegar inside the cup where they will drown. The trap works really well and you'll be amazed just how many fruit flies you catch! After a few days simply discard the trap in the garbage. I like to replace the trap with a new cup and vinegar every 3-4 days until I don't see anymore fruit flies inside the home.